Path of Exile Act 5 is Path of Exile's fifth storyline act. Within this act, the exile returns to Oriath to locate the slaves in revolt. The leader in the revolt claims allegiance to Kitava, a Karui god of corruption. 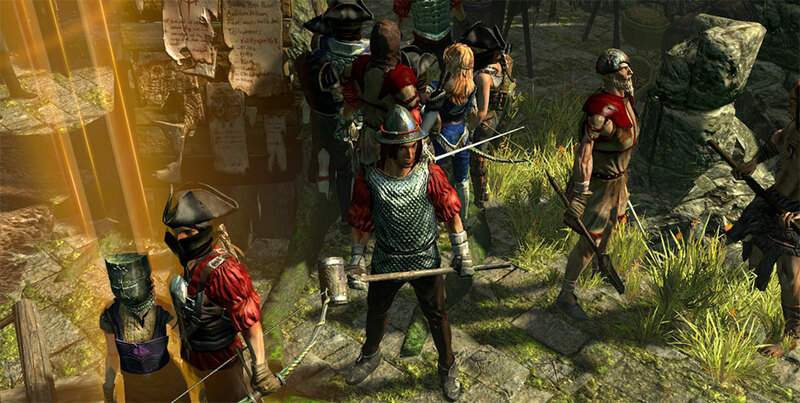 The exile seeks to kill Higher Templar Avarius to become able to finish the tyranny of one's Templars. It covers monster levels 41 to 45, and its town is Overseer's Tower. Overseer's Tower would be the town for Act 5 and is connected for the Slave Pens as well as the Deal with Blocks. Like all towns, it includes a Stash/Guild Stash, Noticeboard, Occasion Noticeboard, and Waypoint. You can find 6 Quests in Path of Exile Act 5, Now EzOkay Will share these quest Step and Reward for you personally. [Area: The Ascent] - Climb the Ascent of Mt. Veruso to locate the portal back to Oriath. [Area: The Ascent] - You have climbed the Ascent of Mt. Veruso and found the Resonator device. Activate it to open a portal back to Oriath. [Area: The Ascent] - You have climbed the Ascent of Mt. Veruso and activated the Resonator device. Now enter the portal back to Oriath. [Area: The Slave Pens] - You have successfully reached Oriath, but are trapped in the Slave Pens. Locate a way to escape. [Area: The The Slave Pens] - You have almost reached safety, but Overseer Krow blocks the way. Kill him to access Overseer's Tower. [Area: The Overseer's Tower] - You have killed Overseer Krow and can now obtain the safety of Overseer's Tower. [Quest Complete] - You have reached the rebel encampment at Overseer's Tower. Talk to Lani for a reward. [Quest Complete] - You have entered the rebel encampment at Overseer's Tower. Talk to Lani for your reward. [Quest Complete] - You have entered the rebel encampment at Overseer's Tower. Lani has rewarded you. [Area: The Ruined Square] - Utula has used the fall of Innocence to summon Kitava, the Ravenous God. Kill Utula to prevent him from completing the King's Feast ritual. [Area: The Chamber of Innocence] - You have killed Utula, but failed to prevent him from completing the routine. Talk to Bannon in the Chamber of Innocence. [Area: Overseer's Tower] - You have killed Utula, but failed to prevent him from completing the ritual. Talk to Bannon for your reward. [Area: The Control Blocks] - Vilenta has asked you to discover and return her Miasmeter that she left behind in her lab within the Control Blocks. [Area: Overseer's Tower] - You have discovered Vilenta's Miasmeter. Return it to her. [Area: Overseer's Tower] - You have returned Vilenta's Miasmeter. Talk to her for your reward. [Quest Complete] - You have returned Vilenta's Miasmeter and she has rewarded you with a Book of Skill. Use it to gain %1%. [Quest Complete] - You have returned Vilenta's Miasmeter, and she has paid you with %1%. [Area: The Reliquary] - Lani has asked you to seek out Kitava's Torments, three mystical Karui artifacts that are being stored within the Reliquary. [Area: The Reliquary] - You have seen one of Kitava's Torments. Locate the other two then deliver them to Lani. [Area: The Reliquary] - You have seen two of Kitava's Torments. Discover the last one then give them to Lani. [Area: Overseer's Tower] - You have found all three of Kitava's Torments, now give them to Lani. [Area: Overseer's Tower] - You have given Kitava's Torments to Lani. Talk to her for a reward. [Quest Complete] - You have given Kitava's Torments to Lani, and she has rewarded you with a Book of Skill. Use it to gain %1%. [Quest Complete] - You have delivered Kitava's Torments to Lani, and she has rewarded you with %1%. [Area: The Control Blocks] - You have been asked to slay High Templar Avarius, the source of the Templar's power, but first you must locate a way to gain access to the Templar Courts. [Area: The Control Blocks] - You have killed Justicar Casticus. Take his Eyes of Zeal to gain access to the Templar Courts and from there, slay Higher Templar Avarius, the source of the Templar's power. [Area: The Control Blocks] - You can now use Justicar Casticus' Eyes of Zeal to gain access to the Templar Courts and from there, slay High Templar Avarius, the source of the Templar's power. [Area: The Chamber of Innocence] - You have been asked to slay High Templar Avarius, the source of the Templar's power, who is somewhere within the Templar Courts. [Area: The Chamber of Innocence] - You have been asked to slay High Templar Avarius, the source of the Templar's power, who is somewhere inside the Chamber of Innocence. [Area: The Chamber of Innocence] - You have been asked to slay High Templar Avarius, the source of the Templar's power, in the Chamber of Innocence. [Area: The Chamber of Innocence] - You have slain Higher Templar Avarius, the source of the Templar's power, and a mysterious shadowy figure named Sin has appeared. Talk to him to locate out more. [Area: Overseer's Tower] - You have slain Higher Templar Avarius, the source of the Templar's power. Talk to Lani for your reward. [Quest Complete] - You have slain Higher Templar Avarius, the source of the Templar's power. Talk to Lani for your reward. [Quest Complete] - You have slain High Templar Avarius, the source of the Templar's power. Lani has rewarded you. [Area: The Control Blocks] - You have been asked to help the rebellion and kill Justicar Casticus. He should be located somewhere within the Control Blocks. [Area: The Control Blocks] - You have found Justicar Casticus. Kill him to help the slave rebellion. [Area: Overseer's Tower] - You have killed Justicar Casticus. Talk to Lani for your reward. [Quest Complete] - You have killed Justicar Casticus. Talk to Lani for your reward. [Quest Complete] - You have killed Justicar Casticus. Lani has rewarded you.